Why Everyone MUST Learn How To Shoot! The just-released booklet, Why Jews MUST Learn How to Shoot, provides the answer to the global jihad, which just touched America in Orlando, Fla., killing scores of people in a gay nightclub. Gay “infidels” are a primary target of radicalized muslims terrorizing the world. JPFO, Jews for the Preservation of Firearms Ownership, a supporter of the LGBT community’s right to arms, has published the controversial monograph. 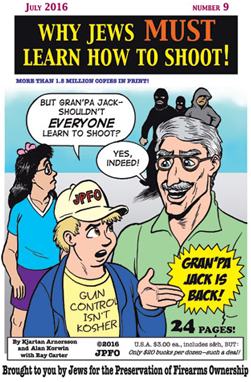 Gran’pa Jack, the main character in the illustrated booklet (the 9th in a series started by JPFO founder Aaron Zelman), advises his grandkids that everyone, not just Jews, must learn how to shoot because of all the evil in the world. As fate would have it, he specifically mentions you must know how to shoot armed jihadis, as well as other outlaws, using guns to stop them when they harm innocent people. The booklet is written so a child can understand it, but covers topics adults may not get if they rely on so-called mainstream sources for their news and information. Guns serve invaluable roles in American society, but are only portrayed in uniformly negative ways in the old media. Gran’pa Jack and his grandkids and friends have an educational time going to the range, learning how and why guns are useful and historic traditions for most Americans. Guns save lives, protect people and robust private firearm ownership is why America is still free. “Why don’t they teach us any of this in school?” Jack’s granddaughter asks. Gran’pa takes an honest look at the lack of education taking place in so many schools today and the role of educators as suppressors. Jack’s black chum Leon adds candid commentary on the state of affairs in the black community, broadening the appeal, making it clear all Americans are potentially targets of attack. Bible passages are mentioned only to illustrate that the Book recognized evil exists and resisting it with force, even lethal force when absolutely necessary, is reasonable behavior, justifiable and required to preserve the precious gift of life. Gran’pa Jack and JPFO propose the only course of action that is proven effective to thwart the jihadis and mass murderers—who always arm themselves illegally when seeking to prematurely end our lives. “YOU must learn to shoot.” As the jihad intensifies, you may come around to this view. A rogues gallery of other modern-day villains is included. This booklet expresses JPFO’s resistance to the anti-freedom approach to safety of some public figures campaigning to diminish the public’s right to arms. Reducing your access to the quality firearms and ammo our police and military prefer, as some misguided politicians are demanding, only makes matters worse, since we face the same adversaries—as the Orlando murders showed. “The correct response to a mass murderer is not to restrict the public, but to empower the public and give us every advantage possible over potential criminals.” –JPFO Policy. Bloomfield Press believes candidates and politicians who do not support an uninfringed right to keep and bear arms for decent regular citizens are not worthy of holding office and should be removed. Get and read Gran’pa Jack #9, then give it to someone you love. Buy a dozen for only $20 bucks and do some good with them. Why Jews MUST Learn To Shoot! Send these to your relatives.